Our roots go back to Europe, before WWII, to a man named Wolf Grunberg. Wolf was born in Kishinev, a small city in what was then part of Russia, in 1911. Wolf’s family earned its living by buying and selling wares in their village. However, Wolf wanted to find his own destiny, and at the ripe old age of 17, Wolf left his family, and set out to learn a trade of his own. He apprenticed for a number of years as a jeweler and watchmaker for several jewelry shops in Kishinev and other cities along a southeast route, heading in the direction of Bucharest, Romania. Along the way, Wolf met Anna Brucker, and it was love at first sight. After marrying Anna, Wolf settled in Bucharest, Romania, where he opened a jewelry repair shop. Wolf’s repairs quickly evolved into actually creating his own work – magnificent, one-of-a-kind jewelry for women, and hand crafted gold wristwatch cases for men,. In addition to jewelry production, Wolf’s deep understanding of valuing gold and jewelry enabled him to effectively make collateral loans against gold and jewelry. Tranquility lasted only a few years, as the effects of WWII began to ensnare Romania. In 1940, Wolf knew he needed to escape the possible destruction of his work and family. Luckily, Wolf counted Colonel Mateiescu, a powerful officer in the Romanian Army, as one of his esteemed clients. Mataeisescu not only valued Wolf’s fine quality and workmanship, but was moved by Wolf’s charm and integrity, and vowed to help. Mataeisescu arranged for special traveling papers for Wolf and his family, sending them 300 miles north to Chernowits, where Irving, his son was born. The family remained in Chernowits for five years, where Wolf loaned much needed money to the local residents, leading up to and during the war. 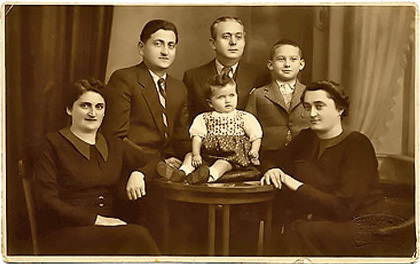 Ultimately, the emotional and physical toll of the war and its aftermath became unbearable, and Wolf uprooted his family for a better life, immigrating to Israel in 1950. After seven years of a tough relocation to Israel, Wolf and his son Irving agreed to leave their new homeland for the promise of the United States. They settled in Brighton Beach, Brooklyn, with only three possessions to their name: 1) $100 cash, 2) a few schmatas of clothing, and 3) a dream to make it happen in the United States. Wolf and Irving both worked the jewelry benches in Manhattan’s downtown jewelry district, for many years on Canal Street. Finally in 1965, they were able to open a shop uptown on West 47th Street, when the district relocated there. Here, they were able to resume selling fine antique jewelry and providing collateral cash loans to the industry. Wolf passed away in 1990; however, Irving, his wife, sister, daughter and son, Joseph, are all involved in the current operations of Lombard Mutual, your premiere gold and jewelry buyer and collateral loan provider since 1948.